I've wanted to attend a GREAT Theatre production in St. Cloud for a while now - I have a lot of family in the St. Cloud area and have attended events at the Paramount Theatre where they often perform, so I thought it would be a fun thing to do to expand the geographic area of Cherry and Spoon. 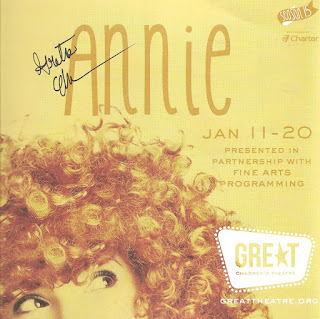 But I never quite found the right show, until my youngest cousin Greta was cast as Duffy in Annie. And even better - the production would take place at my alma mater, the College of St. Benedict, on the very stage where I used to perform as a member of the Wind Ensemble when I was a student there many years ago. So it was with much excitement that I made that familiar drive to CSB with my parents to see the show with about 15 or so members of my large and supportive extended family. While of course the production of a community theater in St. Cloud is not quite at the level of professional theaters in Minneapolis/St. Paul, the love of live theater and the desire to share that love with the audience and children in the community is still there, and that's what's important. GREAT Theatre (which stands for Great River Educational Arts Theatre) has stated values that include "honoring the imagination of children - their involvement in the arts cultivates curiosity, creativity and endless exploration" and "sharing the wonder of live theatre - the resulting joy is something all people should experience." That's definitely something I can support. GREAT Theatre borrowed the sets, costumes, and music from the Broadway tour of Annie. Unfortunately the music is canned (they could have easily filled the pit with the talented music students from St. Ben's and St. John's), but the sets and costumes look fabulous on the stage of the Escher Auditorium in the Benedicta Arts Center. GREAT doubled the number of orphans normally in the show to give more children the chance to participate in the show, and who can argue with that? There's really nothing cuter than a bunch of ragamuffin little girls running around the stage singing and dancing, and director/choreographer Alison Feigh does a great job placing them around the large stage and keeping them in line. All of the kids are enthusiastic and joyful and totally in the moment, especially Greta Eherenman as Duffy and Aedyn Colville as the scrappy little Molly. 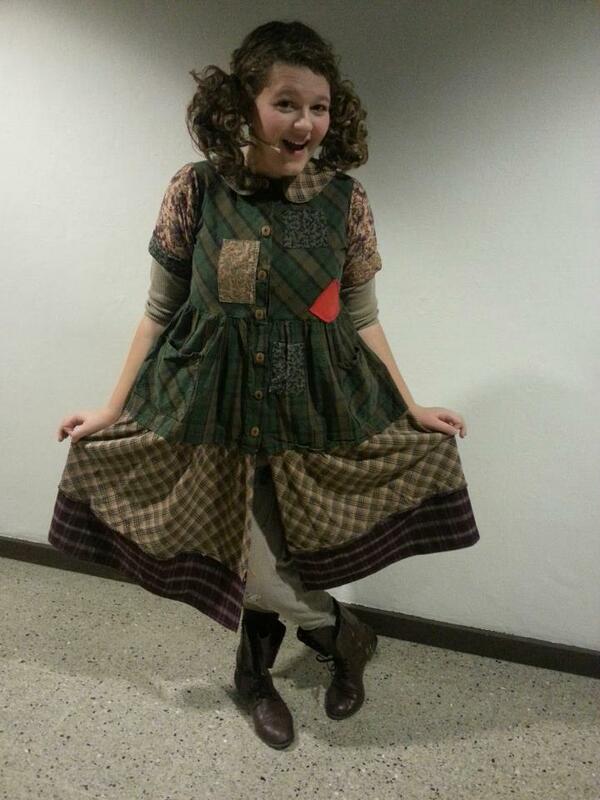 Making her mainstage debut with GREAT, Katie Amdahl does an impressive job as our heroine Annie. The kids are joined by a bunch of experienced adult actors. Standouts include Mike Harens as a very likeable Daddy Warbucks, and Megan Potter (who would fit right in on any Twin Cities stage with her beautiful voice and stage presence) as Mr. Warbucks' assistant Grace. I brought Greta (and her mom) to see the Peter Rothstein-directed Annie at the Children's Theatre a few years ago (where we met Peter who was sitting right in front of us!). I couldn't be more proud and thrilled to see her up on stage doing the show herself. GREAT Theatre is doing good work bringing live theater to the community and kids in particular, which I think is a pretty cool thing. There could very well be a few future theater stars on that stage, and this experience is helping them along on that journey. I look forward to seeing more GREAT Theatre productions (especially those starring the talented Greta, who I've always known is a star), and perhaps exploring the St. Cloud theater scene a bit more (please email me if you know of other St. Cloud theaters I should check out). Wherever you live, go support your local community theater!